If you let the first video finish, it goes on to the next and the next about lack of vaccinations and what is happening. Misinformation is probably too much of a mouthful, but idiots will do I dare say. Actullay is doing, that is making the rounds on Facebook. Dang, the internet memes are on fire today..
Last edited by AutumnGirlLybbie on Sat Feb 07, 2015 12:11 am, edited 1 time in total. "I don't use memes as a source of information" is perhaps the funniest inadvertent irony I've ever seen. I am fairly certain that gunpowder, gelatine, dynamite, and laser beams do not cause autism. They are just guaranteed to blow your mind. I'm currently reading 'The Reason I Jump' by Naoki Higashida. A friend had recommended it to me one or two years ago and I finally got around to buying it. Oh wow! This was just posted on my miniature horse questions group on fb, and thought it might be of interest here. It's really not much more than speculation, but it's still interesting that this work cross-over research is being done. I saw your daughter in resus today. You knew she was sick. I asked you how long she'd had seizures for. You said today was her first. I asked you if she'd had a fever, rashes, pain. You described to me the symptoms of measles. I intubated your daughter in resus today. You said you wanted to stay, you said you wanted me to talk through what I was doing. I showed you how we intubate a child today, how we give the drugs, insert a tube in her throat, thread a large tube into her neck and another into her artery, and another into her bladder. You said that you never realised measles could do this. I transferred your daughter to the PICU today. You told me how she loved to paint and to make perfume from flowers, at the cost of your perfume which she used to make it smell better. You told me that she was the first in her class to read, that she could write her full name and address and knew all of the words to Frozen. I watched your daughter seize again today. I explained that this wasn't a good sign. You told me the paediatricians had said the same. You told me that she had been having drugs through her central line, and fluids and her urine output was good. I watched your daughter pick up a spoon today. It's been a month since I saw you last. You told me that she has progressed so much in the past three weeks. You told me she now recognised your faces when you come into the room and can make a sound that you recognise means she wants her teddy. I saw you in the corridor today. Another month has passed. You told me that your daughter can now crawl and is just about able to say mummy and daddy. I saw you in the coffee shop today, another month or so has passed. Your daughter had another seizure. 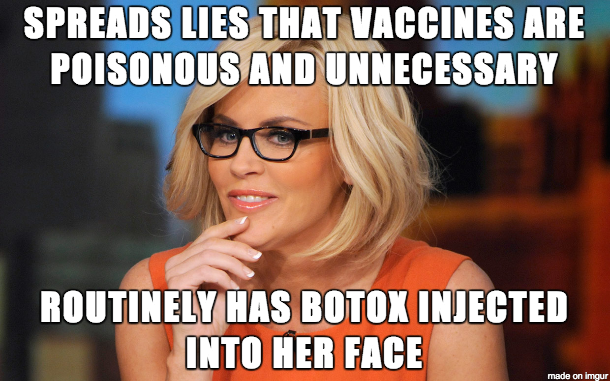 You asked me whether you had caused this by not vaccinating her. I told you that I didn't know. I lied to you in the coffee shop today. You asked me a question and all of the current evidence says yes, your daughter has the complications of encephalitis because you didn't vaccinate her. I couldn't do that to you. You did what you thought was best based on the information that you had at the time. You are not scientists, you are not doctors. You are parents and you were understandably worried. I asked if there was anything I could do for you. You asked if I could please tell people to vaccinate their kids. I said I would try. The news is finally coming out and saying that vaccines do not cause autism. It's about damn time they tell the truth. Look what all this has caused!